The NorthPoint construction project, under way in East Cambridge, is less a new development than a new small town: 5.2 million square feet of buildings on 45 acres, 2,500 new residences, 20 buildings on 19 blocks, a 10-acre central park, and retail space with no telling how many Starbucks cafes. But urban communities need transit, and in the project's second phase, which the developer is breaking ground on this morning, the T will come to NorthPoint. Development manager Jones Lang LaSalle, a global real estate firm based in Boston that now includes the former Spaulding & Slye, is building a sleek new $70 million MBTA station on NorthPoint property. 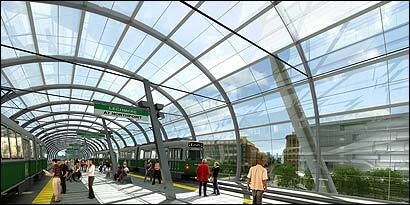 When it opens in 2010, it will replace the Lechmere T station, operating on the Green Line across Monsignor O'Brien Highway, an outdated facility whose name is a legacy of a neighborhood and a retail store that no longer exists. For the time being, the new station will be called Lechmere at NorthPoint, although the developers, Pan Am Systems Inc. of Portsmouth, N.H., and Spaulding & Slye Investments, would like to shorten it to NorthPoint. Placing the NorthPoint community adjacent to an MBTA station is consistent with the trend toward "transit-oriented development" -- which aims to reduce people's commuting times, combat high gasoline prices, and avoid more sprawl. Developments are planned along heavily used commuter rail lines in the roomy suburbs, like the planned Westwood Station at 128 Station. Closer to downtown Boston, there are multifamily housing projects under construction on MBTA land at Woodland Station in Newton and Ashmont Station in Dorchester. Even in depressed downtown Worcester, a large mixed-use project with a substantial housing component is being drawn up, not far from Union Station, on the Framingham-Worcester commuter line. The new Lechmere Station at NorthPoint is being built as part of a six-year initiative to install most of the transportation foundation for the buildings to come. It includes construction of a street grid for the area, an old Guilford Transportation railroad yard, and a pedestrian-friendly reconfiguring of the adjacent O'Brien Highway. At least one commercial building, of 270,000 square feet, will be built along with the station, but getting the transit station and roads in, at a total cost of $130 million, will make the rest of NorthPoint possible. "That opens up six or seven buildings of development opportunity," said Thomas J. Hamill, project director. "With an active market in Cambridge right now, it's great." Recent market figures from the real estate firm Richards Barry Joyce & Partners bear out the developer's optimism, at least in today's market. "East Cambridge has been the center of an absorption frenzy over the past three years," said RBJ president Bob Richards, "which has brought about dramatic declines in vacancy along with declines in space choices for prospective tenants." The new road network includes an extension of First Street from East Cambridge across O'Brien Highway and north through NorthPoint, passing by the location of the new T station. It will be NorthPoint's Main Street. "A majority of our retail and amenities will be along this corridor," Hamill said. The first phase of NorthPoint construction began last year -- two residential buildings with a total of 338 condominiums priced from the mid-$300,000s to the $800,000s. One building, with 99 units, will open in late spring, with about a third of the units already sold. The second building, with 239 residences, is scheduled to open late next year. The new phase beginning today will open up 1.8 million square feet of mixed-use development, including a hotel. Four buildings -- one with restaurants and shops, one a lab, and two with office and ground-floor retail -- are scheduled to be completed by mid-2009, just before the new T station goes into operation. The next three years will also see two parking garages built, with 1,100 spaces, later to be surrounded and topped by residential space. The centerpiece of phase two is the station, being paid for by the developer but undertaken in a public-private partnership with the Massachusetts Bay Transportation Authority. Not only will it be "a catalyst for future growth on the project," said Kyle B. Warwick, regional director of Jones Lang LaSalle. In addition, "it does help us knit NorthPoint into the East Cambridge neighborhood." One major advantage of the relocated MBTA station is it will allow the authority in the future to extend the Green Line to Union Square in Somerville and Medford. The station is being designed by Parsons Brinckerhoff's private division and Handel Architects LLP of New York. Handel was the architect for Millennium Place in Boston. NorthPoint's master plan was done by Ken Greenberg of Toronto and CBT/Childs Bertman Tseckares Inc. architects of Boston. Under an agreement with the City of Cambridge, the developer will build the roads -- with names like Amelia Earhart Street, Julia Child Street, and Glassworks Avenue -- and turn them over to the city . Jones Lang LaSalle also has agreed to clean and maintain the MBTA station for 10 years. The tube-shaped structure, made mostly of glass and steel, is a state-of-the-art design, Warwick said. The Legislature approved MassDevelopment bonds for $130 million -- guaranteed by the value of the NorthPoint land -- to enable the company to build most of the streets, sidewalks, green space, sewage systems, and utilities. That will pave the way for 18 more buildings -- residential, commercial, and parking garages -- as the market calls. NorthPoint's planners are banking on a strong demand for office, technology, and laboratory space in their development, which when finished will have more than 2 million square feet of commercial space. Although some of those buildings won't be completed for several years, the market currently looks good. The vacancy rate in laboratory buildings in the area has dropped from 32.2 percent to 6.3 percent in just two years, according to Richards Barry Joyce & Partners figures. In the office market, vacancy has fallen from 27.7 percent to 13.3 percent in a little over a year. Hamill said Jones Lang LaSalle has been discussing each of the individual commercial blocks with possible future users, who have asked for details of the buildings being planned. "That shows the depth of the market and demand for anything over 100,000 square feet," Hamill said. The buildings are being designed by different architects, following an international competition that the developer held for NorthPoint in 2003.